The Assassin is a hired killer, a professional who undertakes the murder of individuals for money, patriotism, or personal gain. Like warriors they are well trained in the use of weapons but unlike the latter, the Assassin would rather do their best to kill without having to face their opponent and then disappear before anyone has the chance to alert the local guard. They are trained in various techniques to kill quickly and efficiently. Most people consider Assassins cowards but the work of professional espionage is not for the feint of heart. Assassins operate as part of a Guild and are often assigned their targets. 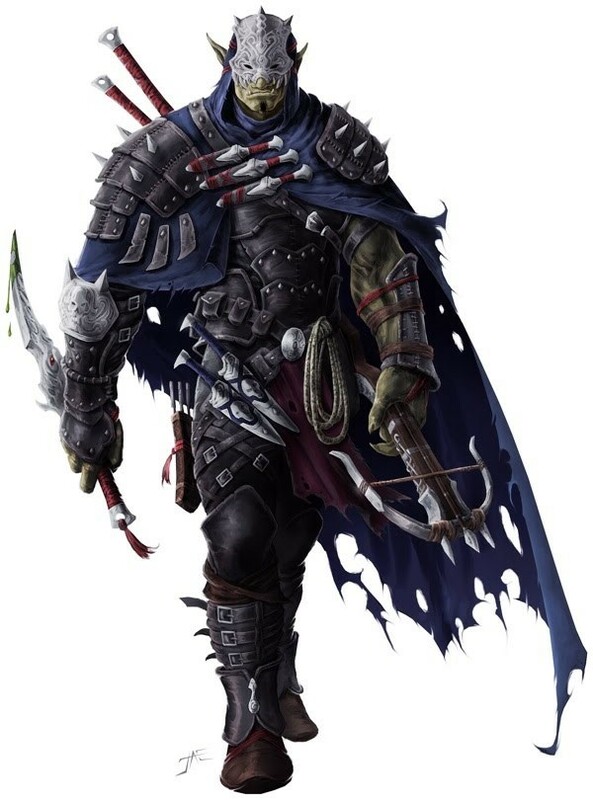 There are very few freebooting Assassins but those players who opt to take their Assassin that route sacrifice the Special Advantage of Guild, though they certainly gain a measure of freedom. During their career Assassins receive training similar to that of a thief but these skills are all designed to better his chances of eliminating the target. With this in mind they are taught to use poisons, special weaponry, and subversive tactics to achieve their aim. The primary attributes for this class are Dexterity and Intelligence, with Constitution as secondary. Dex: 13 Constitution: The Assassin has been dining on a diet of poisons for some time and gains a steadily increasing resistance to them. The character starts with a base 35% resistance to common poisons and adds 2% per level. Unusual or Rare poisons may be resisted based on a 2% per Constitution point total. Dex: 14 Tools of the Trade: Now well trained in the art of killing the Assassin gains the use of two unique weapons. The Garrote and the Blow Pipe, both of which are used at a +4 bonus to hit. Gamemasters may substitute alternate exotic weapons of assassination at their discretion. Chemistry: The Assassin is no longer simply a tool of death, he may fashion what he needs to do the job himself. He may, given the availability of ingredients, prepare certain proscribed poisons within a day. The base chance is 35% + 2% per level, which yields D6 doses. The Assassin may also identify poisons and can detect poison in food or drink given a successful Intelligence check. *The ability to attempt this move may be dependent on combat situations, which will be determined by the Game Master. –The Assassin is under the tutelage of past masters in his field. He gains all the standard skills of a thief and Backstabs as a thief as well. When in an area where the guild operates, the Assassin need not worry for money, lodgings, or supplies, though the precise level of these amenities may vary. This also translates into a +4 to all Disguise checks. –To backstab is a function of getting a good shot in on an unwary foe but to kill requires a special degree of training. The Assassin has been educated in this delicate yet vicious art. If the Assassin surprises a victim, he may attempt an assassination. This must be stated prior to the attack and the percentage chance of success is listed on the Assassination Chart below. The Assassin has learned a curriculum of subterfuge and pain in his time at the guild. Some secondary skills also accompanied this training. The Assassin is trained in many skills similar to that of a thief in order to more effectively achieve his objective. Unlike the Thief, the Assassin learns these in a more proscribed fashion and follows the charts below for both Thief skills and his Assassination percentages. As stated in the introduction the Assassin is almost exclusively someone trained as part of a guild or organization that specializes in retaining individuals for the express purpose of murder. Sometimes they will be part of a larger Thieves Guild, sometimes an agent of a local ruler, king, or other great noble, and of course there are other organizations and Guilds who feel it necessary to have such men and women working for them to insure their work goes unimpeded. 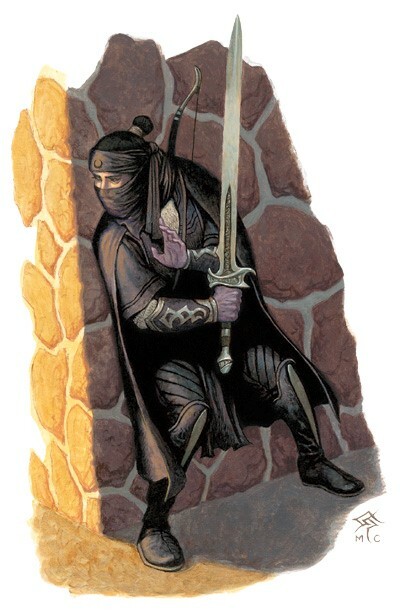 Because of the variety of possibilities there are also many motivations for an Assassin but regardless they are still trained killers and as such they can only be Neutral to Evil in Alignment (excluding Neutral Good), even if they feel that what they are doing is for the greater good. Assassins can be from any background or social class and usually are. The character must have a minimum of 13 Dexterity, 11 Intelligence and a 12 Constitution. Assassins are, with rare exceptions, trained by other professionals in a formalized environment. Thus they will be given jobs to do and be taken care of in a reasonable fashion. Some Assassins may accumulate wealth through the course of their career either by using people or a cover profession so as to stay under the radar. Likewise they may be expected to return to their patron a percentage of any gain as a tithe of sorts or they may be required to place all treasure into the common vault to be distributed to everyone as needed. Regardless, the Assassin rarely lacks comforts, good equipment, or other necessities in order to remain a well oiled machine of death.